Attending church services on a regular basis is very important to my family. However, keeping my children on their schedules is also a top priority to our family! We knew when we decided to follow Babywise techniques that we would have to make some sacrifices but that attending worship wasn’t something we would sacrifice. I now have a four year old and a sixteen month old and thought I’d share some of our tips for handling children at different stages during worship service. We personally try to avoid taking our kids to the nursery (and our church doesn’t have a separate worship service specifically for children either) as we feel it’s important for them to be in services with us. Their little minds are soaking in more than we even can realize and we want to train them to behave during services and teach them how to participate in services as well! Our church services are from 10:30-11:30 so when our babies are little it’s usually feeding time. I pump prior to services and bring a bottle to church. I’m just personally not comfortable nursing in public and don’t want to leave services to go nurse in a private setting either so pumping a bottle works great. Often it’s the only time my baby will get a bottle during the week so it also helps keep them used to bottle feeding. Since we would have to leave for church during nap time my little ones would often fall asleep in the car seat on the way and we would just bring in the infant car seat to services to let them continue sleeping. Both of my children were slow drinkers so they would typically eat close to the entire hour. After they finished we’d go change their diaper and then try to keep them quiet for the remainder of services. Once our kids are on the 4 hour schedule it’s a little trickier because we have to leave for church right in the middle of nap-time. We have found that it’s best to wake them up earlier on Sunday mornings (we typically wake them up at 7:10 but on Sunday’s we wake them up at 6:45). That way we can put them down for their morning nap extra early as well (Rather than them going down at 9 like usual we put them down as early as 8:10). We try to have their awake time that morning very active to help wear them out and make them tired enough to sleep that early for nap. Usually it works out where they get a 45-60 min nap prior to us having to leave for church services so they aren’t completely exhausted for the entire time! Since we wake them up early and feed them early for breakfast, it also allows me to push their lunch earlier too and I will do the same pump a bottle thing to feed during church services. Once they are eating solid food it is a little tricky, with our son my husband would take him out of services to go feed him jarred baby food. With my daughter, we didn’t stress as much as we did with our son (typical second child, right?). I knew she didn’t have to have solids at every mealtime and that solid food was more about learning than it was about nutrition at that age so I just skipped solids for that one feeding time a week. Once I wean my children from nursing I push their lunch time back to noonish rather than right after their morning naps. This means that they no longer have a meal time during church services. I will bring each child a sippy cup (even the 4 year old!) of water and a snack cup with simple, unmessy type foods (raisins, goldfish, cereal, etc). Then we rush home to eat lunch as soon as services let out. Since a toddler no longer has a morning nap, we also no longer have to deal with working around it so Sunday mornings get easier! Keeping a toddler still and quiet during services is a challenge. I try to have them run around a lot before services start. This is a great chance to visit with others in the congregation since we have to rush out right after! Since a toddler cannot yet whisper I work hard at keeping them quiet by keeping them engaged with lots and lots of toys and a variety of things to keep their interest. I try not to be overly concerned with “baby talk.” Our preacher has stressed many times that he loves hearing the children during services b/c it means he knows they are there and that’s important! I will repeat anything they say in a whisper and put my finger to their lips to remind them to be quiet. Usually around 18 months they are able to whisper and understand the need to be quiet during that time! If the toddler gets too loud one of us will take them out and sit with them in another area of the church where we can hear what’s going on but they can’t disrupt others. Our church has a “training” area set up just for this purpose! Training becomes very important at this stage. Once our children have the ability to whisper and we know for sure that they understand what is expected of them during services, we will begin disciplining for misbehavior. We give a few warnings and bring along our spank stick (a paint stick) from home to use as a rod of correction. If they make a poor choice that requires correction we will take them out of services, discipline, comfort, then bring them back in. At this stage we expect more out of our children. Our son is four and we still allow him to play with toys, color, eat snacks etc. But we don’t allow him to lay down during services and expect him to stop and pray when prayer is taking place, stand and pay attention during the songs, and be respectful during other aspects of worship. He is in charge of giving our tithing in the collection plate and usually sits and listens during the lesson as well. Little People wheelie cars are wonderful as their wheels don’t make any noises and they are age appropriate even for a toddler. I have also found many great sensory type games (nuts and bolts, people that stack together, and yarn with beads to lace) and even great soft puzzles at our local dollar store! I bring a clipboard and use Bible coloring books (again, a dollar store find) and our son has enjoyed drawing and coloring since he was close to two years old. My favorite church bag item is a soft picture book that I filled with photos of our family. Both of our kids love looking through it! 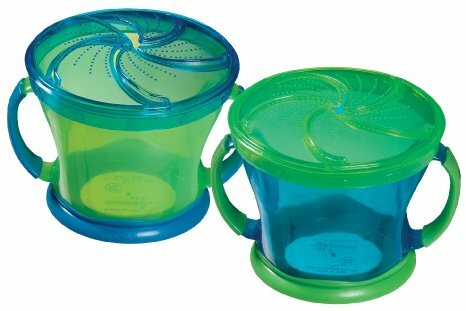 For the snack cups I love these by Munchkin! As a parent with young children church services can sometimes feel like you’re in “survival” mode. I recently joked with our preacher that I have no clue what he preaches on most of the time. It can be tough, even with well-behaved children, to get through it. There have been times I have thought “why do we bother?” but then I am reminded that it’s all worth it. When our son asks questions during the lesson that make me realize he’s paying attention. When the elderly members at our congregation light up with pure joy when seeing our daughter walking down the aisles after services. When we see our children mature in their prayer life and their relationships with the Lord. Every phase in life has it’s own struggles and challenges and I know we may not be able to be as active in our church family as we’d like to be during this portion in our lives. However, we always strive to put God first in all things and I’m so thankful that we are instilling that same value into our children from birth! It may be tough at times, but it’s always worth it!!! Next Post Albion Fit WINNER! Thanks so much for the suggestions! I love the family picture book. I will also have to look at getting one of those quiet books. Great ideas! We have all three children (5, 3 and 1) in the service with us. Our services is 9:30-10:30, then we all go to separate classes from 11-12. Right now we all sing abd pray together, then my husband sits with the two preschoolers who color and I stand at the back with the baby who, if all goes well, can get a short nap in my arms/sling. I find simpler a is better….we stopped the snack during the service as it was too distracting. Instead they get one around 11:30 in their classes. For some reason, this post gets a ton of spam comments so I am going to turn the comments off for this post.